Strawberries are a popular fruit to plant in home gardens because they take up very little space, are beautiful to look at, and if taken care of properly, can yield plump juicy strawberries. Strawberries are susceptible to damage from bugs. Keeping bugs off your strawberry plants can be done organically with the use of natural household items, or with chemical insecticides. It is also important to plant strawberries properly to attain a healthy strawberry plant that will be less susceptible to pests. Plant your strawberries in tgood soil. Talk to your local garden shop to find out if the soil in your area is conducive to growing strawberries. Add soil amendments to achieve a soil pH between 5.5 and 6.5. Adding organic materials will achieve a rich soil for strawberries. Choose a good location to plant your strawberries. Strawberries require good drainage and ample sunlight. Strawberries can be planted in pots, in flat ground or on a gentle slope. Strawberries resist pests better when they are not overcrowded. Avoid planting strawberries near tomato, potato or pepper plants. These plants attract fungus that can spread to strawberries. Pull weeds as they appear in your strawberry garden. Weeds attract pests, which can damage your strawberry plants. Use mulch to prevent the growth of weeds. Wash your strawberry plants once per week with soapy water or neem oil. Mix one teaspoon of dish detergent in a spray bottle and fill it to the top with water. Spray the leaves with the soap mixture to remove aphids. Follow the directions on the neem oil bottle for mixing and application. Grow garlic or chives in your strawberry garden. Many bugs do not like the smell of these two plants, including aphids. Bugs will avoid your strawberry plants to stay away from the smell. You can also plant marigolds among your strawberries, as they repel bugs. Spray strawberry plants with water. Use a hose end sprayer to knock spider mites off the plants. Spray the undersides of leaves as well. 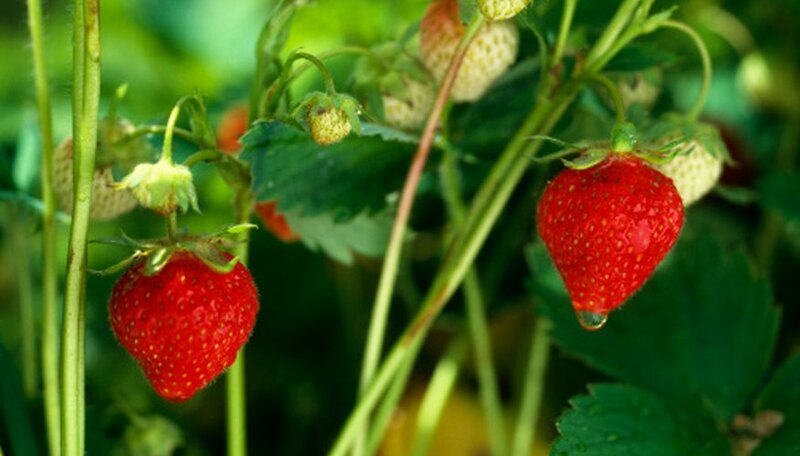 Treat your strawberry plants with an insecticide labeled for use on strawberries. Follow instructions for the number of days between use and harvest. Mix and use according to manufacturer's recommendations. Eliminate slugs and snails from your garden with iron phosphate granules. Use approximately 1/2 lb. of iron phosphate for every 500 feet of garden space.